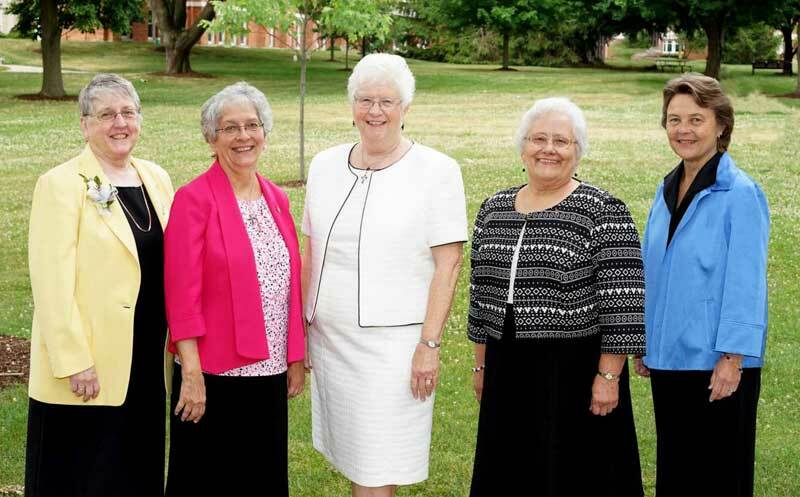 Members of the 2016-2022 General Council are, from left: Sister Frances Nadolny, OP, Administrator and General Councilor; Sister Patricia Harvat, OP, General Councilor; Sister Patricia Siemen, OP, Prioress of the Congregation; Sister Mary Margaret Pachucki, OP, Vicaress and General Councilor; and Sister Elise D. García, OP, General Councilor. July 8, 2016, Adrian, Michigan – The new Prioress and General Council of the Adrian Dominican Sisters formally took office on July 2, 2016 during a special Liturgy, the Celebration of Leadership. The Congregation’s new leadership team is composed of Sister Patricia Siemen, OP, Prioress of the Congregation; Sister Frances Nadolny, OP, Administrator and General Councilor; Sister Mary Margaret Pachucki, OP, Vicaress and General Councilor; and Sister Patricia Harvat, OP, and Sister Elise D. García, OP, General Councilors. Elected during the Congregation’s General Chapter in February 2016, they will hold office through June 2022. Sister Attracta Kelly, OP, the outgoing Prioress of the Congregation, welcomed an assembly of Adrian Dominican Sisters, Associates, and Co-workers, as well as special guests of the new General Council members and representatives of sponsored institutions and other Congregations of women religious. 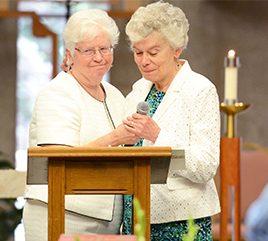 Sister Patricia Siemen, OP, new Prioress of the Adrian Dominican Congregation, with Sister Attract Kelly, OP, former Prioress, during the Celebration of Leadership Liturgy. On behalf of the Congregation, Sister Attracta thanked the “five generous-hearted Sisters” for their willingness to serve, and promised the “unending love and prayer” of the Adrian Dominican Sisters and Associates. The new General Council succeeds the 2010-2016 General Council. Along with Sister Attracta, they are Sister Corinne Sanders, OP, Administrator and General Councilor; Sister Tarianne DeYonker, OP, Vicaress and General Councilor; and Sister Kathleen Schanz, OP, and Sister Rosemary Abramovich, OP, General Councilors. As Prioress, Sister Patricia Siemen holds the highest ordinary authority in the Adrian Dominican Congregation. She will be responsible for promoting the unity of the Congregation, as well as representing the Adrian Dominican Sisters in Church and civic affairs and chairing the General Council. Sister Patricia is not new to Congregation leadership. She served as Chapter Prioress (“Major Superior”) of the Sisters in the Congregation’s Mid-Atlantic Mission Chapter from 1988 to 1992, when she was elected to serve as Vicaress/General Councilor until 1998.
respects and protects the natural world in its own right. She has also served at Barry University, Miami Shores, as an adjunct faculty member and, since 2010, as a team member of Barry’s Office of Mission Engagement. From 2001 to 2004, she directed the Earth Ethics Institute at Miami Dade College, and, as a staff attorney with Florida Rural Legal Services, worked with immigrant farmworkers in Florida. Sister Mary Margaret brings a wealth of education and leadership experience to her new position. After teaching for years at Catholic elementary schools in Ohio, California, Arizona, and Michigan, she served as principal of two schools in the Diocese of Lansing: St. Patrick School, Brighton, from 1978 to 1986, and St. Joseph Academy in Adrian from 1986 to 1993. Sister Mary Margaret then taught at St. Anne’s High School in Modimong, South Africa, from 1993 to 1996. She served as the School and Curriculum Consultant for the Diocese of Toledo until 2001, when she returned to Africa to serve as National Coordinator for Literacy and Numeracy for the Catholic Institute of education. She has served since 2008 as President of Regina Dominican High School in Wilmette, an all-girls college-preparation school sponsored by the Adrian Dominican Sisters. In her position as Vicaress, Sister Mary Margaret would take on the responsibilities of the Prioress should Sister Patricia Siemen become incapacitated or vacate the office. Sister Frances’s earliest experiences of leadership included serving as principal of St. Thaddeus School in Chicago for five years. She also served the Archdiocese of Detroit as Director of the Department of Education, Associate Superintendent of Schools, and Superintendent of Schools. For the past two years, she has served as the Director of the Congregation’s Ministry Trust Office, which provides grants to organizations in which Adrian Dominicans minister, lead as Board members, or volunteer.. In addition, Sister Frances was elected Chapter Prioress (Provincial) of the Congregation’s Great Lakes Dominican Mission Chapter, based in Detroit. Sister Patricia Harvat has spent much of her ministerial life serving overseas: from 1973 to 1981 serving in Head Start and in pastoral work in Puerto Rico and directing the Congregation’s Lay Ministry Program in the Dominican Republic from 1982 to 1989. She then returned to the United States to teach theology at Gabriel Richard High School in Riverview, Michigan, until 1993. She has also served as Director of Formation for the Adrian Dominican Congregation and as Director of Lay Ministry Formation for the Hispanic Ministry Office of the Diocese of Cleveland. Since 2008, she has served at St. Mary’s Dominican High School in New Orleans, sponsored by the Dominican Sisters of Peace. In 2011, Sister Elise began her ministry to the Adrian Dominican Sisters as Director of Communications and Technology, overseeing many of the Congregation’s technology upgrades. After three years, Communications and Technology were separated into two departments and Sister Elise focused on Communications. Before coming to Michigan, Sister Elise and Adrian Dominican Sister Carol Coston founded and directed Santuario Sisterfarm, an ecology center based in Boerne, Texas, and dedicated to cultivating biodiversity and cultural diversity. The organization also established Sor Juana Press, which published such titles as the Dominican Women on Earth series and Drawn by Love, the history of the Dominican Congregation of St. Catherine of Siena of Mosul, Iraq. Sister Elise was founding editor of Sor Juana Press. Sister Elise has served as Director of Communications and Development for St. Mary’s University School of Law in San Antonio, Texas; Vice President for Membership and Media Communications for Common Cause in Washington, DC; and as consultant to numerous national and regional non-profit organizations.